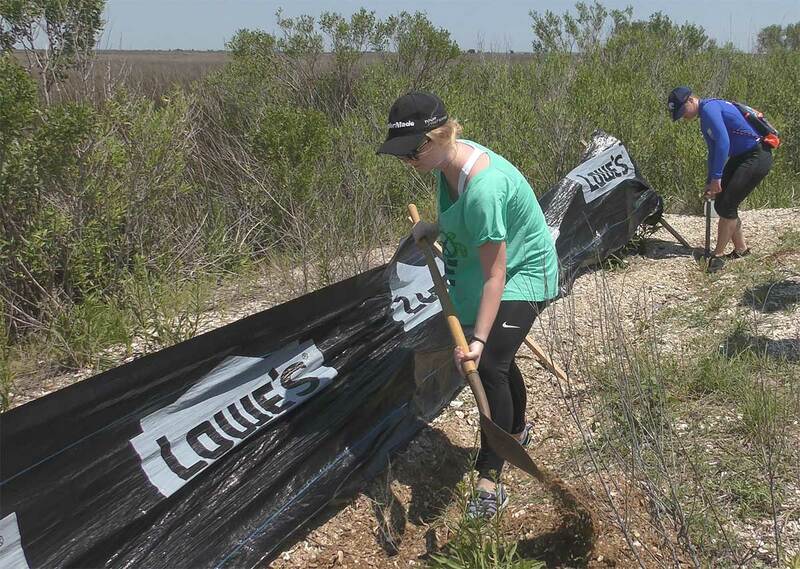 Spring Hill College sophomore Taylor Lewis helps to dig a trench during the Marine Turtle Conservation Course taught by UAB's Dr. Thane Wibbles. The Dauphin Island Sea Lab's partnership with 22 of Alabama's universities and colleges brings dozens of students to campus during the summer months. The students, through enrollment at their home institution, can earn up to 16 hours of summer credit through DISL"s University Programs each summer. Once on DISL's campus, students spend little time inside the classroom. Each class has a number of field opportunities from trips aboard the Research Vessel Alabama Discovery to the Florida Everglades. Taylor Lewis, a sophomore from Spring Hill College, loved getting into the field right away with Dr. Thane Wibbles' Conservation of Marine Turtles course. "I was honestly expecting just pure lectures for the first week of classes," Taylor Lewis, a sophomore from Spring Hill College, said. "I didn't know we were going to come out and do some hands on learning . It's actually really cool. I love it." Lewis said her DISL class experience was an amazing one, and she looks forward to being back for a full summer in 2018. "It was great to get hands on experience, since this is something I am wanting to extensively study and research. We visited the Mote Marine Lab, The Turtle Hospital, and the Loggerhead Marine life Center," Lewis said. "It was great traveling in such a small group because we got to ask the researchers a lot of questions and get high quality answers. Going on this trip also opened up a lot of internship opportunities not only for me, but all DISL students." Summer courses are broken down into three sessions: May Term, First Session, and Second Session. To learn more about the classes offered and how to register, go to disl.org/univ-prog.